I work with many clients who struggle to get their days started without feeling overwhelmed, stressed, depressed, or anxious. What many individuals fail to realize is that waking up on the “right side of the bed” starts with your nightly routine. While they are completely different parts of the day, having a relaxing, yet proactive and productive nightly routine can make for a better start to your morning, especially if you are someone that is required to wake up early for your job. 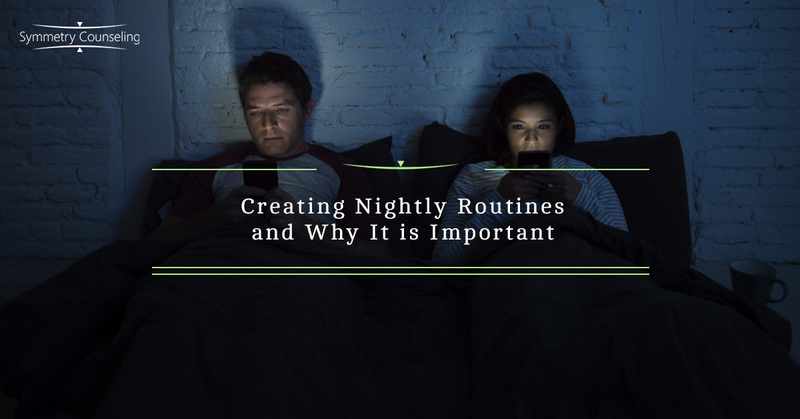 So, what are important things to incorporate into your nightly routine to make for a successful morning? Below is a simple guide to get you started! Prepare for the morning. This may sound simple, but many people neglect to prepare their mornings, which then causes them to wake up stressed and with no time to relax in the morning. An easy thing to take care of the night before is to prepare your breakfast and lunch for the next day or set out your clothes. Reflect. After writing your to-do list, use some quiet time to reflect on all of the things you did that you felt were accomplishments during the day. After a long day, praising yourself for what you accomplished can be a perfect way to practice some self-compassion. Oftentimes people focus on what they did not accomplish, but it is important to reflect on what you did accomplish. Wash your face. While I am not claiming to be an esthetician, as a therapist I am aware that simple acts such as mindfully washing your face can be very calming and therapeutic. You can even think of it as washing away any of the stressors you interacted with that day. Physically and literally cleansing! Mindfulness. We all have stressful days, so at the end of the day, practicing some mindfulness techniques can be very useful in setting yourself up for a good night’s rest and a good night’s rest can create a more energized morning. Do some light yoga, deep breathing exercises, or maybe a guided meditation through an app such as HeadSpace or Sanity&Self. Transform your bedroom. Turning your bedroom into a place of serenity and calmness can also be crucial in a nightly routine. It may be worth investing in a small oil diffuser and some lavender essential oil. Some people also enjoy putting drops of lavender oil on their pillows and sheets as a form of aromatherapy to help create calmness before sleeping. Turn off the screens. It can be very tempting to want to stay connected to our screens before we go to bed, and for some, it does not affect their sleeping cycle. However, if you find that you have trouble winding down, consider replacing screen time with a good book and some hot tea (that isn’t caffeinated). Stay tuned for my next blog post where you can learn about how to start your day off implementing effective morning routines! If you are currently struggling with anxious mornings and implementing a nightly routine, it may be a good idea to connect with one of our skilled counselors at Symmetry Counseling today. You can contact them at 312-578-9990 to set up an appointment.